If passed by Cincinnati voters, Preschool Promise will help fund two years of quality preschool for every child in the city. Before the innovative strategic concept of Collective Impact was advanced by The Greater Cincinnati Foundation, two local organizations were already engaged in fostering collaboration between entities capable of effecting necessary change: StrivePartnership and United Way of Greater Cincinnati’s Success By 6® initiative. In fact, Strive was the principal inspiration for social theorists who defined and championed the Collective Impact approach. The Carol Ann and Ralph V. Haile Jr./U.S. Bank Foundation brought FSG to Cincinnati in 2007 to help that then-new foundation define its giving strategy, says Senior Vice President Leslie Maloney. Kania and his colleagues met with numerous community leaders in Greater Cincinnati. In addition to her role with the Haile Foundation, Maloney today chairs StrivePartnership’s executive board. StrivePartnership has, in fact, led the way to establish a national network of 67 communities, StriveTogether, that are practicing this kind of civic infrastructure nationwide. 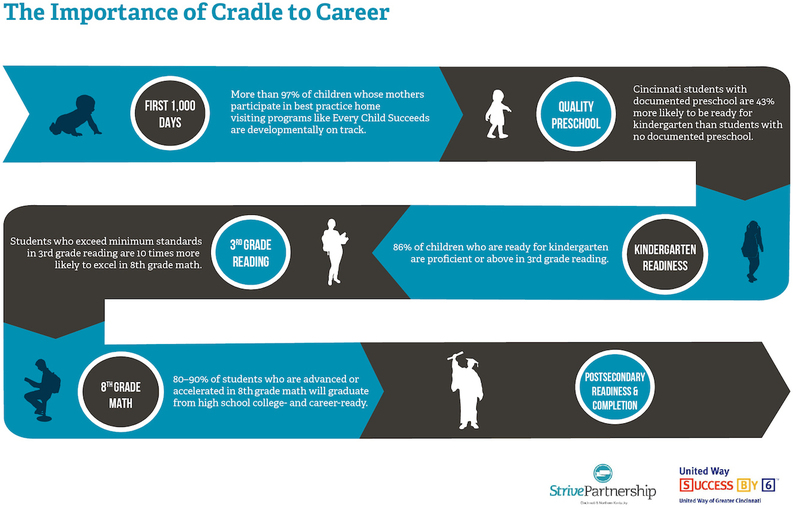 StrivePartnership’s cradle-to-career strategy is rooted in the belief that education is an absolutely essential engine of economic growth and individual success. Its programs seek to ensure that every child is prepared for school, is supported inside and outside of school, succeeds academically, enrolls in some form of post-secondary education and graduates to enter a meaningful career. The path to these goals focuses on building, reinforcing and continuing to sustain a strong, supportive community. It begins with the first 1,000 days of a child’s life by providing new mothers with expert home visitation. The next step is quality preschool, laying a foundation for kindergarten readiness. Children who are prepared for kindergarten have the greatest success in reaching third-grade reading proficiency. Those third graders are 10 times more likely to excel in eighth-grade math, the next step in the process, leading toward attaining high school graduation and being ready for post-secondary education. That pathway builds stronger, higher-achieving populations and better lives for citizens of communities with such systems in place. The Greater Cincinnati Foundation began convening Collective Impact initiatives in 2011 to address significant community issues beyond the capacity of single organization to solve. StrivePartnership was the ideal archetype for an effective “backbone” that would focus on orchestrating efforts by numerous organizations, businesses and individuals at work in the education sector. 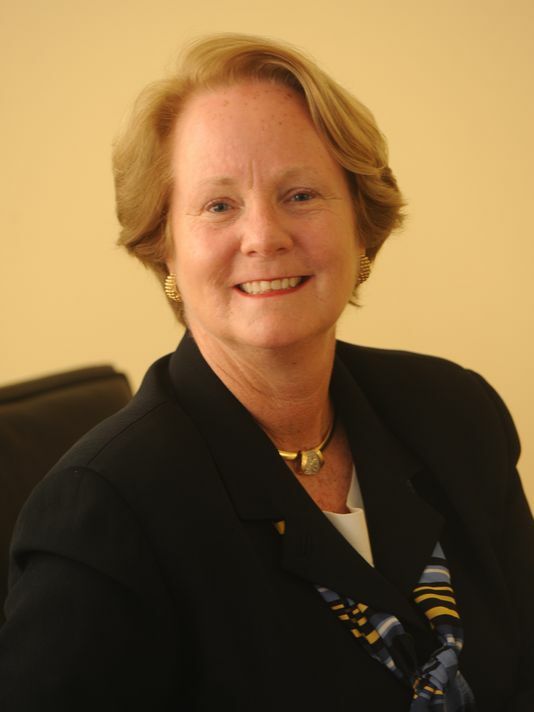 In fact, The Greater Cincinnati Foundation supported Strive from its inception, and retired GCF President/CEO Kathy Merchant served as its chair for over three years. Identified as a second backbone was Success By 6®, the United Way initiative focused on advancing the circumstances of children in the zero-to-5 age range. The Greater Cincinnati Foundation helped launch the program in 2003 via a $500,000 grant to address issues identified in the wake of Cincinnati’s 2001 civil unrest. Stephanie Byrd has been Executive Director of Success By 6® since day one. “Our mission has been to look at early childhood as a predeterminant to a child’s success in school,” she says. In particular, the issue of educational equity — meeting the needs of children living in poverty — was elevated to a level of critical community concern that both Strive and Success By 6® were already addressing and continue to focus on a decade later. As with other backbones supported by The Greater Cincinnati Foundation, StrivePartnership and Success By 6® orchestrated collaborations with numerous community organizations and services. Emily Lewis, director of operations for StrivePartnership, cites a joint effort with a not-so-obvious partner: Cincinnati Children’s Hospital Medical Center. “We’ve jointly created a continuous-improvement, capability-building and training series we call ‘Impact U,’” she says, adding that the partnership draws on the respected pediatric hospital’s expertise in quality improvement and translates it for the social sector. The Haile Foundation’s Maloney holds up StrivePartnership’s Every Child Capital Venture Fund as a different way of handling philanthropic support. This fund identifies programs having an impact, ensures they will produce the desired outcomes and seeks partners to sustain activity once the program is established. Every Child Capital identified Imagination Library, a program launched by singer Dolly Parton providing preschool-age children with age-appropriate books on a monthly basis. It’s typically supported by community volunteers who raise the $25 per child cost working through libraries or schools. Every Child Capital paired Imagination Library with Cincinnati Children’s Reach Out and Read, the local iteration of a national program that trains pediatric healthcare providers to talk to families about the importance of reading. “Those providers are probably the only people who see these children on any kind of regular basis,” Maloney points out. With funding from the Haile Foundation (joined later by the Emery Foundation, Fifth Third Fund, Greater Cincinnati Foundation and others), children coming to clinics across the city are being enrolled in Imagination Library. Since it began in August 2015, about three-quarters of the 10,000 Medicaid-eligible children ages zero-to-5 in Cincinnati have enrolled. Cincinnati Public Schools (CPS) stands to benefit from this partnership, according to Maloney, to the point that the district now plans to absorb the program’s full cost. It means many more kids will show up for school better prepared. It will help many of them read at an appropriate level by third grade so they don’t have to be retained, as required by the State of Ohio. Most importantly, the district gets a database of families that helps to anticipate fall enrollments. Classrooms in one school might have double the number of students expected, so teachers have to be paid for “overload,” adding significant annual expense. It’s a perfect example of how StrivePartnership’s role as a backbone matchmaker between organizations — using principles of Collective Impact — makes a big difference. Success By 6® has long had as one of its primary goals preparing children to succeed and especially to reduce educational and social disparities among underserved people. Research has shown that family income is the strongest predictor of kindergarten readiness, with preschool experience a close second. Winning Beginnings — a partnership among Success By 6®, United Way, Cincinnati Public Schools and others — was established nearly a decade ago. Kindergarten readiness scores in the district have increased annually, frequently outperforming other major urban high-poverty school districts in Ohio. Expanding preschool opportunities brings a community as much as a 4-to-1 return on investment. A recent comprehensive review by the respected RAND Corporation demonstrated the benefits of investing in preschool expansion: Estimated returns are $2 to $4 for every $1 invested. Savings come from increases in school readiness, reductions in instructional intervention, special education and grade repetition as well as higher rates of high school graduation. Business leaders in the Cincinnati USA Regional Chamber’s Class 36 of Leadership Cincinnati traveled to Denver to study the impact of high-quality preschool programs there, which previous leaders — including Maloney and Strive Executive Director Greg Landsman — had done several years before. The Leadership Cincinnati members came back convinced of the necessity to provide universal preschool in Cincinnati and revived an initial model put together by Landsman. Now collaborating with Cincinnati Public Schools, StrivePartnership and Success By 6® have assembled a tsunami of support for Preschool Promise, a component of CPS’s tax levy request on the Nov. 8 ballot. That funding would carve out $15 million per year for five years for Preschool Promise, representing a big step forward in achieving the partners’ goal of providing two years of quality preschool for every child in the school district. It’s all hands on deck for improved preschool experiences for children. Of course it’s been endorsed by United Way and The Greater Cincinnati Foundation, but many more community organizations are on board — the Cincinnati Business Committee, Cincinnati USA Regional Chamber, the AFL-CIO Labor Council, the Cincinnatus Association, the League of Women Voters and the Hispanic Chamber of Commerce, to name just a few. One of those was the RAND study that convinced many business leaders that universal preschool programs would indeed make a difference. Success By 6® has recruited players to the cause whose added perspective and support makes a significant difference. In particular, Byrd cites the AMOS Project, a faith-based social justice community organization that knits together congregations from numerous religious institutions. 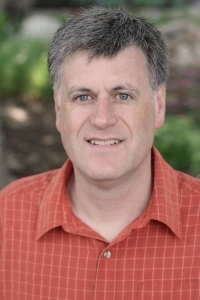 Troy Jackson AMOS Project Executive Director Troy Jackson says his organization has “a deep commitment to the role of faith in the public arena.” He adds that many congregations involved in AMOS serve people who are profoundly affected by poverty and educational deficits. When he became AMOS’s leader in 2014, Jackson had numerous conversations with clergy, community leaders and church members. “One of the things I heard most about was the childhood poverty rate,” he says. He also heard about Preschool Promise. AMOS has engaged thousands of people through public meetings and church gatherings, including a screening of the television documentary The Raising of America: Are We Crazy About Our Kids? lamenting the lack of public investment in early childhood education in the U.S. More than 1,000 people attended. Jackson praises the leaders of the StrivePartnership and Success By 6®. The Preschool Promise ballot initiative website is here. The documentary film The Raising of America: Are We Crazy About Our Kids? can be viewed here. Download the 2016 RAND Corporation study “Informing Investments in Preschool Quality and Access in Cincinnati” by Lynn A. Karoly and Anamarie Auger here. Read the April 2016 Center for American Progress report “How Much Can High-Quality Universal Pre-K Reduce Achievement Gaps” by Allison Friedman-Krauss, W. Steven Barnett and Milagros Nores here. AMOS members are working at a grassroots level to turn out voters in November. The hoped-for success of Preschool Promise will be the result of collaborations fostered by The Greater Cincinnati Foundation’s Collective Impact initiatives and their commitment to equity. As inspiring backbones, Success By 6® and StrivePartnership have used Collective Impact to bring together businesses, organizations in the social service and health sectors and educational communities to support Preschool Promise, an essential program for advancing our community’s quality of life. This is Part 4 of a Soapbox series of reports exploring how Collective Impact is changing and improving Greater Cincinnati, with the final report to come on Oct. 25. Support for this Collective Impact series is provided by The Greater Cincinnati Foundation. Infographic by Steph Landry Design and StrivePartnership. Stephanie Byrd has served as Executive Director of Success By 6® since it was established locally in 2003. The organization is in the forefront of the Preschool Promise initiative that’s part of the Cincinnati Public Schools levy request being put before voters in November. Success by 6®, which operates within United Way of Greater Cincinnati, is another “backbone” organization advancing the Greater Cincinnati Foundation’s various Collective Impact initiatives, collaborations between various community players to address big, complicated issues. Soapbox: Is Success By 6® a national movement? Stephanie Byrd: At one time there were as many as 360 programs across the U.S. Some still exist, some don’t. Many became more direct-service oriented initiatives. Here in Cincinnati we stayed away from that arena because there are so many programs already doing great work in the early childhood space. Our focus has been to align with existing work and get programs to adopt a common vision for early childhood programs. You use a “whole child” approach. What does that mean? SB: It takes more than one factor to make sure a child is ready for kindergarten. Many communities focus primarily on literacy, but other areas are equally important, especially social and emotional development — making sure that a child is able to interact with others and do well in a classroom setting. Other important factors include physical development and health — ensuring children have nutritious meals and their fine-motor and gross-motor skills are well developed. Other cognitive skills come into play such as math and science as well approaches toward learning. All of these make up a “whole child” approach to kindergarten readiness. You’ve worked with many other organizations to pursue this vision, haven’t you? SB: We partner with many programs and school districts across the 10-county region. Strive Partnership helps strengthen the connection between kindergarten readiness and third-grade reading. 4Cs for Children provides training and coaching for teachers to foster highly rated programs. The Community Action Agency, the federal contractor for Head Start programming, has participated in Learning Circles since its inception; they now look at data in the same way as other community providers. 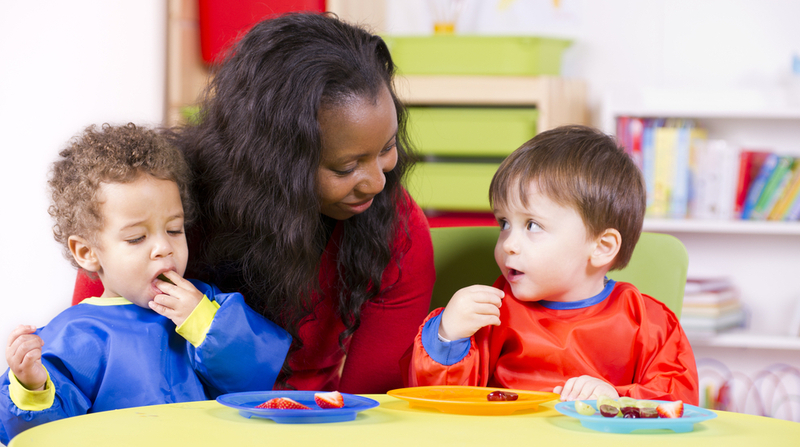 Childcare partners such as Cincinnati Early Learning Centers, the YMCA and Cincinnati Union Bethel are involved working with Learning Circles and in ongoing advocacy. PNC Bank helps us broaden awareness around kindergarten readiness as a partner in the Kindergarten Readiness Summit. How will the Preschool Promise initiative expand your mission? SB: Success By 6® is not a direct service provider. We focus on the zero-to-5 age group, working with parents and programs, focusing on the supports needed to improve kindergarten readiness. The Preschool Promise will address this in two ways. First, it will provide access to high quality early education programs for preschool-age children. Second, it will provide resources to providers who want to increase quality and participate in Ohio’s quality rating system. These resources haven’t been available through traditional payers like the state. With the new funding we’ll start with 4-year-olds and include some 3-year-olds with higher financial needs. For now, preschool expansion will happen within the Cincinnati Public Schools district and will include public and community programs. Of course, United Way and Success By 6® serve a 10-county region; preschool is a major factor in what we’re trying accomplish across the region. We are doing great work elsewhere — for instance, in the Erlanger School District and other districts in Northern Kentucky. We’re looking at expanding preschool in other areas. There’s a campaign to support this and other kindergarten readiness work in Middletown, and we’re exploring where else we might make high quality preschool possible. We know working families need it across the region. We certainly want to go beyond Cincinnati and Hamilton County because we know poverty is moving outside of the city. It’s as much of an issue in some school districts in our region as it is in Cincinnati. Preschool Promise in Cincinnati is the first step. We hope it will inspire similar efforts across our region.